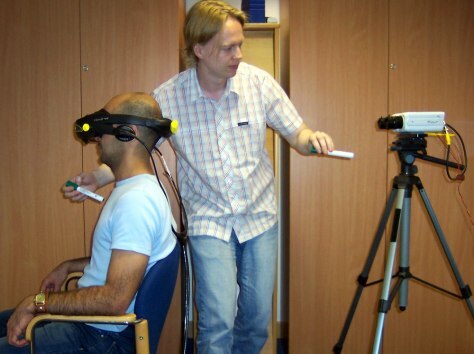 A volunteer wearing virtual-reality goggles watches the back of his own body, as seen from behind by the camera. He is also watching a plastic rod moving toward a location just below the camera, while his real chest is simultaneously touched in the corresponding spot. The subject typically felt as if he was being poked in the chest while he was outside his body.